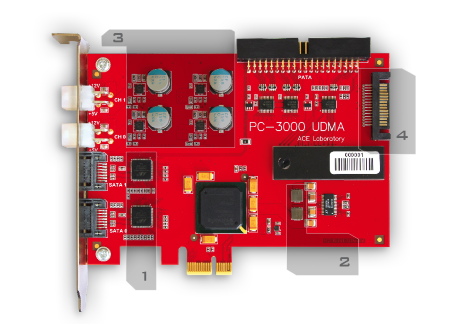 New enhanced PC-3000 UDMA is getting even more efficient! PC-3000 UDMA has really become a main “workhorse” for daily use in every serious data recovery lab. It has gone from strength to strength since its release in the market, and it's just hit another milestone - 10,000 boards! We continue to renovate and update the solutions for you. And today it’s our pleasure to announce that your main data recovery tool has been refreshed! As a result of the changes, PC-3000 UDMA has become even more stable and faster. The new 88SA8052-64 QFN Serial ATA 3.0 Gb/Sec bridge chipset. The data transfer speed and the SATA ports stability have been increased. Shading rings of the 1.2V and 3.3V power supply regulator on Xilinx chipset. The stability of power supply and the noise control have been improved. Enhanced circuitry of the power control adapter. The connection of balanced capacitors has been changed. The printed board of the adapter has been improved for large currents. A highly reliable power supply connector - SATA POWER - has been used. The safety and stability of HDD power supply have been boosted. It’s high time to upgrade the previous version of your PC-3000 PCI and green PC-3000 UDMA to the newest PC-3000 UDMA or PC-3000 Express functionality! To get the renewed PC-3000 UDMA, please send a message to sales@acelab.eu.com or contact your personal sales representative.